One of my favorite aspects of traveling has always been planning an itinerary. I spend hours upon hours researching where we're staying and what we should do nearby. Are there any hikes we should tackle? Any self-guided day trips we can embark on? Any amazing places we absolutely need to splurge on and reserve for dinner? We set out to achieve five travel goals in 2016, one of them being to plan less and, as a result, be more spontaneous. But you can't stop an A-type personality from planning, just like you can't stop a traveler from traveling, so I decided to compromise on that travel goal and planned a comfortable, easily adjustable itinerary for our trip to Iceland. If you're looking for a slow, open-ended itinerary for 7 days in Western Iceland, then our itinerary might just give you some great ideas. Especially since it's been—mostly—tried and tested by yours truly. Note: We visited Iceland in November. Your experiences may vary if you go during a warmer time of year. The day before arriving in a new place is always magical for us, so magical that we have a hard time focusing on work (because we always take evening flights and have to work during the day)! After we got off work, we packed our final items, like toothbrushes and toiletries and the shirt we just washed since we wore it yesterday, then headed to the airport a few hours early. Once we navigated through security—which generally goes pretty quickly now that Mr. Nerd has TSA Precheck— we found the nearest airport bar, sipped on a flight of delicious French wines, and embraced the fact that we're finally on vacation! If you're headed to Iceland in the winter months, we highly recommend donning a sweater before you get on the plane. 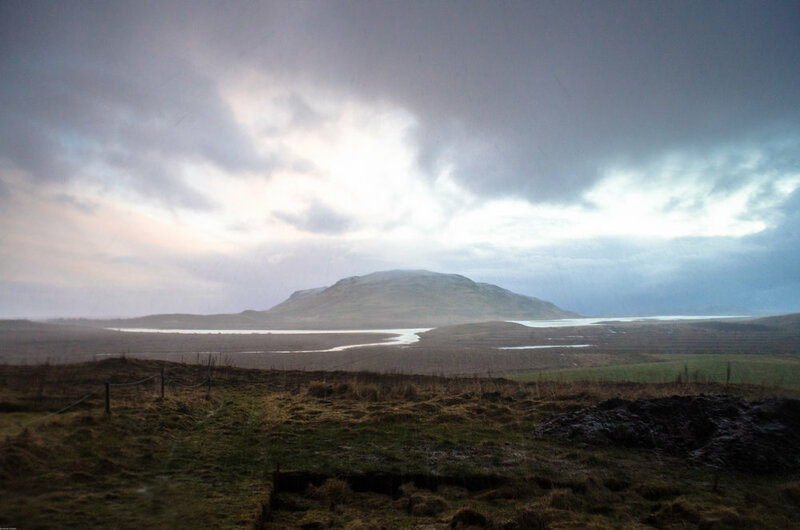 It can be pretty chilly (and even drizzly) when you arrive—remember, weather in Iceland changes without warning! If you don't want to put it on yet, a sweater can act as a pillow to aid sleep and relaxation. If you're taking an overnight flight from the US, you'll arrive at Keflavik International Airport around 6:30 a.m. If you're not from the US, we recommend taking an early flight so you'll have the rest of the day to get settled in a new place (another great way to maximize those vacation days, folks)! Once you're through customs, pick up your rental car (if you're renting a car—we did, and we definitely recommend others do, depending on the time of year. Driving in Iceland is not scary, we promise, and it gives you a lot of freedom) and drive the 20 minutes to the Blue Lagoon. Since we arrived at 6:30, we booked a reservation for the Blue Lagoon at 10 a.m. to make sure we'd have enough time to leave the airport, find our car, and make our reservation. If you're late? Well, you might be out of luck. They take reservation times seriously, as only a certain amount of people can enter the Lagoon at once, so do be punctual. It's a popular place! We ended up getting to the Blue Lagoon almost an hour early based on pure luck. There's a cafe just inside if you're hungry; we weren't able to enter earlier than our reservation, so we grabbed a beer and a club sandwich at the cafe for an early breakfast (a little pricy, but when you've been on a plane for 6+ hours and haven't eaten in a while, anything sounds good). Once inside, we spent a good two hours in the water, sipping on adult beverages, taking embarrassing selfies, and soaking away all our travel aches and cares. The great thing about being at the Lagoon is once you're in, you can stay as long as you'd like! Just make sure to get out every once in a while and cool off, and remember to drink water. Also, ladies and gentlemen, definitely put conditioner in your hair. Lots of conditioner. You'll thank me later ... when it still looks soft and doesn't feel like clay. After spending a morning of relaxation at the Blue Lagoon, we drove the 20-30 minutes along the coast to Reykjavik. We stayed at Reykjavik City Hostel near the city center, close enough to all the action (a 10 minute drive to the famous church Hallgrímskirkja) and affordable enough for our wallets. Reykjavik City Hostel was nice, with shared rooms and private rooms, all the facilities you could want (including a coffee shop and free Wifi), and a free parking lot. We stayed in a private room with its own bathroom (always nice to have) and paid around $60 USD a night. In our opinion, not too bad for Reykjavik. If you're not into hostels, there are a lot of nice hotels and inns around Reykjavik that may have decent prices if you book enough in advance. Able to check in early, we unpacked and took a nap (only because we didn't manage to sleep a wink on our overnight flight). That evening, we bundled up, grabbed a coffee from the cafe downstairs, and explored the streets for a time. We found a city public pool nearby, as well as a Icelandic hot dog stand (which soon became a favorite stop of ours after a long day of adventure). Depending on how you feel on day #1, we suggest walking around and seeing what you can find. There are a lot of little shops, cafes, restaurants, and bars around Reykjavik. Public transportation (mainly buses) are great and widely used, so if you don't have a car you can get around that way. Otherwise, if you're staying at a hostel, check out the bulletin boards in the main lobby. A lot of travelers offer free rides to other backpackers. To be honest, this could be a whole post in itself. I'll keep it to the highlights. On day #2 of our trip, we spent our entire day wandering around downtown Reykjavik on a self-guided tour. There's so much to see and do; Reykjavik is an incredibly fun city. We started our day by driving to Hallgrímskirkja and parked on one of the side streets. It's good to note here that all streets are paid parking, so make sure to have a debit or credit card on you as that's the easiest way to pay the meter. From there, we walked up to the church ... and took lots of pictures of its architecture and matching Leifur Eiriksson statue. After Hallgrímskirkja, we stopped by Cafe Loki, which is right across the street, and had our first taste of delicious Icelandic cuisine. 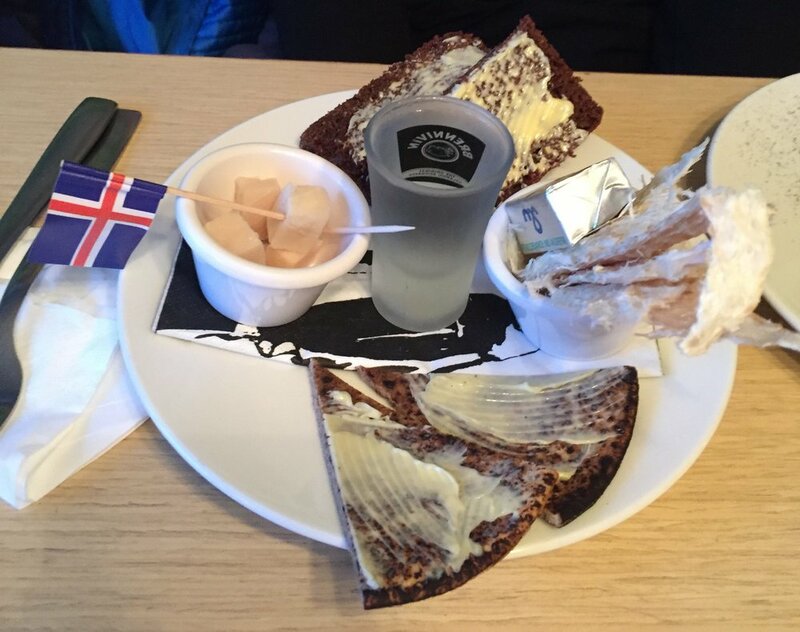 This is a perfect (albeit a little spendy, but most places you eat in Reykjavik are going to be $30-50 USD for two people) place to try meat stew, mashed fish on rye bread, fish jerky, crepes, and even the infamous harkarl. From Cafe Loki, we walked north, past Laugavegur (their main shopping street) and up to the shoreline where we visited the Sun Voyager—a metal sculpture created as an ode to the sun in 1990. We continued west along the coast until we reached Harpa Concert Hall. This building is made out of colored glass panes, which creates really unique light shows when the sun comes out! You can go inside and wander around too, if you want (and if you check-in on Facebook, you get a free session of WiFi. Perfect if you have your cell phone or tablet but don't have an international data plan). If you go south from here and head down Lækjargata to Hverfisgata, you can grab a delicious lunch at Bæjarins Beztu Pylsur, the popular hot dog stand that has everyone raving in the streets (perhaps a little overstated, but it's worth hitting)! Hot dogs are one of the cheapest foods you can get in Iceland, so we recommend it either way. After a quick lunch, we went back to Laugavegur and browsed their many shops, cafes, and art galleries. If you're into this sort of thing, the Icelandic Phallological Museum of Penises is on the corner of Laugavegur and Snorrabraut. We intended to visit but didn't when we realized you have to pay a fee to get inside. There are several other museums in the area too, from The Culture House Museum on Hverfisgata and the Reykjavik Art Museum off Tryggvagata (just west of the Concert Hall). We didn't visit any of these (we spent a lot of time in cafes reading books and sipping coffee instead) but encourage you to if you're so inclined. We finished our day with a nice espresso and Icelandic waffle, then returned to our hostel to hang out with other travelers from all over the world (including a very nice Norwegian couple who were keen on seeing the Northern Lights. Good times). On #3 of our trip, we got up early and drove to Reykjadalur Valley, about 30 minutes southeast of Reykjavik. We'd heard a great deal about the amazing day hikes you could do in Iceland, and this was one of them. Reykjadalur Valley is a ravine close to the small Icelandic town Hveragerði (if you go on the Golden Circle tour, you'll probably pass through here as one of your first or last stops of the day). Its rolling hills, trickling streams, and boiling pools (hidden in the rocks like little witch cauldrons) give way to private waterfalls, tall rocky cliffs, and a relaxing river you can swim in if you're feeling adventurous. And yes, all the water is warm, heated by the earth's volcanic soil. The hike took us about three hours to complete, and just getting to the river takes about an hour and a half to two hours (depending on your speed and how many times you stop to gaze at your surroundings with doe eyes). Be warned: the first trek of the hike takes you up, up, up on a bumpy path. Iceland makes you earn those views, so ready those leg muscles for a great workout! If you want to lounge in the river, make sure you stash a swimsuit (as this is a pretty common hiking destination) and towel in your bag. There are public areas you can change and briefly store your stuff. Just keep an eye on your things—you'll be a happier traveler that way. A small tip: If you don't mind carrying your camera with you, bring it on the hike. The views are out of this world. We truly felt like we'd stumbled into the realm of elves and faeries. After a fantastic day of hiking, we drove back to Reykjavik just in time to catch our dinner reservation at The Vox. Generally, when we travel, we budget enough for one splurge meal—and The Vox delivered with a tasty array of fine wine, perfectly cooked reindeer, and mouth-watering appetizers served fresh from the ocean. A hearty meal is necessary after a long hike, and thankfully, Iceland has a plethora of meal options for the Viking in you. We chose The Vox as our "date night" meal, but a quick Google search lists a ton of other restaurant options in downtown Reykjavik. Choose one and enjoy to your heart's content. Once you're done with dinner, consider spending a night on the town*. Reykjavik is known for its night life, apparently, with bars and clubs sprinkled up and down Laugavegur on both sides of the street. It may be cold out, but we've heard that the drinks are good, the music is loud, and if you don't like one place ... well, you can relocate to another establishment within a couple of minutes. Just make sure to budget for drinks and bar food. If it's not happy hour, it's going to be a hit on your wallet (with beers and cocktails ranging anywhere from $7-14 USD a pop). *We'd scheduled a night on the town but decided to skip it, so this is not tried and tested by us. However, we've heard it's fun to do! We left day #4 open to do whatever we wanted (to give us some spontaneity). Since Reykjavik is such a big place, we ventured back downtown and spent our day wandering the streets, trying chocolate dipped waffles, following stray cats, stopping into strange bookstores, browsing through stores way out of our budget, and drinking delicious, strong-brewed coffee. During the evening, we tried to catch the Northern Lights. The forecast was perfect for seeing them that night, but unfortunately, the cloud cover obstructed our view. Still, we'd driven out to the Grotta Island Lighthouse at the very western end of Reykjavik to see them, and standing in the dark with waves crashing against the rocks nearby was a fun (if not chilly) experience. We saved one of the most popular and touristy Icelandic adventures for day #5. It was a Monday for us, which we assumed would be less busy than going out on a weekend (I can't be sure if it was or not; just prepare for a lot of tourists. On the Monday we went, almost every stop was packed with tourists). For the Golden Circle tour, we highly recommend driving it yourself. We were able to spend longer periods of time at the stops we enjoyed ... and less time at the places that felt too crowded for comfort. Otherwise, if you aren't renting a car, there are several tour companies you can hire to take you around the Golden Circle for around $60-70 USD a person. For our first stop, we visited Thingvellir National Park. There's a nice parking lot with room for dozens of visitors, but be warned that if you're driving, you have to pay for parking (and they enforce this severely. We paid, but others didn't, and when we left we saw rows of cars with parking ticket after parking ticket stuck under their windshield wipers). Thingvellir National Park has some incredible vistas. You can also walk down between the tectonic plates; the trails extend for miles, across bridges and over hills. If you follow the crowds, you'll eventually find a couple waterfalls (we departed from the crowds and didn't find these, though, so your experience may vary). You can spend a lot of time here, especially if you're a photographer or nature lover, so plan accordingly. Laugarvatn Fontana is a geothermal spa (probably similar to the Blue Lagoon). We didn't realize this at first and stopped here, only to figure out that it's a spa you have to pay $30 USD per person for. Our budget didn't allow for that, unfortunately, so we didn't go in. Despite this setback, we discovered a cute little cafe next door and popped in for lunch. Well worth the splurge for soup, fish, and a glass of house wine (yum). There are also some lovely views outside, if you want to snap a couple pictures before hitting the road again. Despite being surrounded by tourists, which makes it hard to see what's happening, Strokkur Geyser is an absolute must if you've never watched a geyser blow before (Mrs. Nerd had not, so it was an epic surprise). There's plenty of places to walk around and a lot to see. You'll pass steaming marshes, mini geysers, bubbling holes of mud, and walk on a lot of copper-colored soil. Do note: it smells like sulfur. Also, if you want to see the geyser from start to finish, we recommend waiting for it to erupt. Then, sneak to the front when the crowd turns to leave (as most people only watch it go once). Gullfoss Waterfall was a nice stop, albeit very very crowded. We walked up the stairs to grab some pictures but ultimately didn't stay too long. Though, looking back through our photos, the sunset was very pretty! If you go, we suggest visiting in the summer when the paths are clear of ice. You can get up closer to the waterfall that way (some of the paths had been roped off for safety during the winter season). We stopped by Skalholt Cathedral on a whim; it was our last one of the day, and though it was getting dark, we wanted to fit it in. In reality, it's not much: just a church (which you can walk in) overlooking the ruins of an old religious settlement. But we were the only people there—a huge treat after being crowded out of all the previous stops. Then, it started to rain. The rain turned to sleet, the sleet turned to snow that stung our cheeks, and when the sun broke through, it parted the clouds over a distant mountain. Truly one of the most beautiful experiences we've ever witnessed. For that reason alone, you should consider stopping here. It speaks to the soul. You have a couple of options for day #6. Yay for options! Originally, we'd planned for day #6 to be our trip to Vik, a small coastal town a couple hours southeast of Reykjavik. Vik is prized for its incredible black beaches, striking and solitary churches, and (best of all) rides on shaggy Icelandic horses! Plans change, though, and the fluctuating weather along with dwindling car mileage forced us to nix those plans and do something local instead. However, we have every intention to visit Vik next time we're in Iceland, so if you have time and think this sounds interesting ... go for it! If you need help planning a trip to Vik or have any burning questions on the matter, shoot us an email. We'd be happy to give you what we know. We eventually decided to hike Mount Esja as our last big "hurrah" of the trip. 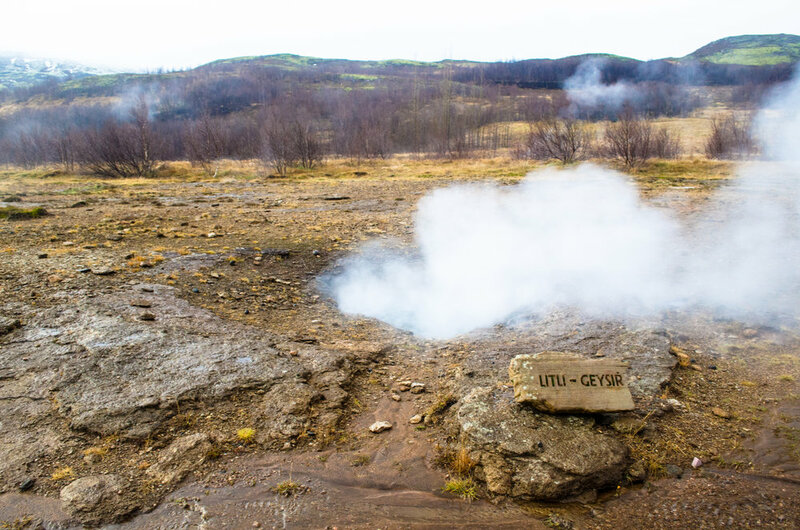 It's a 20 minute drive away from Reykjavik, in a fairly secluded area, with free parking and regular bus access from downtown. It took us a little over three hours to hike 12,000 steps, but wow, what a view! If you're a nature enthusiast and love getting outdoors, this might be the hike for you. RELATED READING: Hiking up Mount Esja. We dedicated an entire post to our hiking experience, with lots of fun pictures included. As your last full day in Iceland comes to a close, now would be a good time to check the Aurora Borealis forecast. Who knows, you might be able to catch the Northern Lights (weather and season permitted)! We didn't get lucky with the lights on our trip, which was a bit of a bummer—the forecast was good, but the cloud cover over Reykjavik thwarted our attempts. Still, it's always worth a shot! You might be in for the surprise of a lifetime. Oct 2017 Update: We returned to Iceland for 11 days and saw the lights three times! It really just depends on luck. 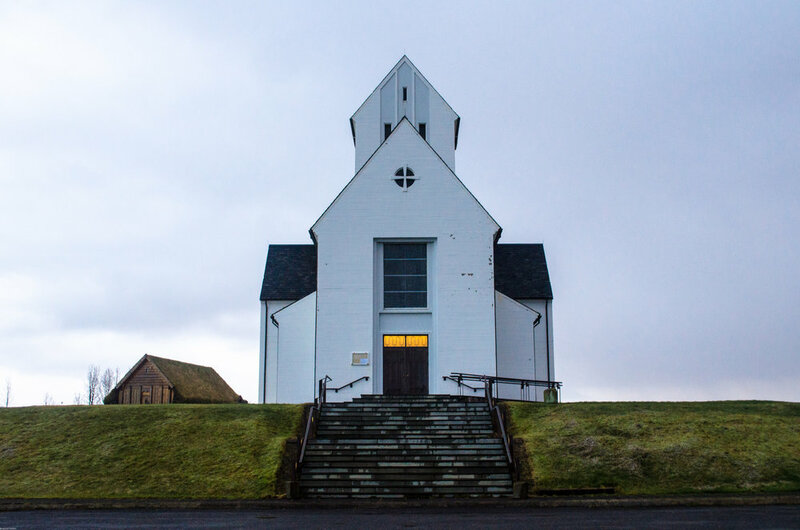 As morning dawned on our final hours in Iceland, we gathered our things, packed them into the car, and drove back to Hallgrímskirkja for a lazy breakfast at Cafe Loki (where we tried all the crazy, unmentionable foods we hadn't been brave enough to try before). From here, we watched the sun come up over the church and toasted to our brief, but absolutely incredible, time abroad. Then, we said farewell to Reykjavik and drove back to the airport, where we dropped off our rental car and got the last two Icelandic beers we could get our hands on as we waited for our flight home. If you're planning a week trip to Iceland, we recommend trying to fly home in the late afternoon/evening (especially if you're from the USA; you essentially go back in time). We left around 5 p.m. and got home around 5 p.m., which gave us a few hours to recover and unpack. Magic!